We are now well on our way into the beginning of 2019 and we are looking forward to the many plans, events, activities, and goals that are in store for us this upcoming year. In looking back over the previous year I would like to, personally and on behalf of the organization, thank you all for your support. Without this support, which was shown in your volunteer time and efforts, in monetary donations and other services, and all voiced or physical support, our organization would not exist, and for that we are forever grateful. As most of you are aware, over the years, due to necessity of changes at state historic sites, the support system that surrounds Fort de Chartres has been responsible for the majority of its events, activities, promotion, education programs, and repair projects. There have been so many hardworking and tireless Les Amis members and other volunteers that have made such a difference in this era of change. 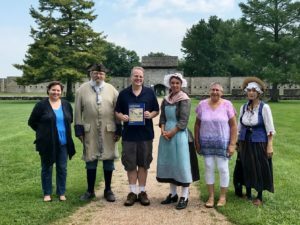 Each year as these support efforts grow in direct relation to the needs of Fort de Chartres, there is also urgency for the growth of this invaluable volunteer system. So included within this message of thanks and gratitude, we are asking for your assistance in accomplishing more. In order to continue to increase our efforts in our mission to preserve, protect and interpret the physical and cultural heritage of Fort de Chartres of the 1700s, we must also continue to expand our support system of volunteers. Growth of our support network can be accomplished through many volunteer avenues. There are current vacancies within our board such as the Secretary and the Vice President of Education positions. There are additional vacancies within our Education and Event committees, the lifeblood of keeping the fort site active and alive with visitors. Along with these open support positions, there are also volunteer opportunities that can be filled remotely, regionally or even out of state. These volunteer opportunities include, but are not limited to, clerical duties and event committee support for both special events and education committees. There is also a need for volunteers helping to find funding sources for general organizational needs and general repair site/project support, and assistance identifying and locating project sponsorships. Finally, additional avenues to volunteer off-site include marketing and website/social media support and assistance with Les Amis promotional marketing. It is absolutely amazing to look back at the recent accomplishments of our organization, all because of the efforts of our dedicated volunteers. And looking ahead, as we continue to grow our volunteer support network, our goals and accomplishments for our mission can be limitless. For those that have helped in getting where we are today, THANK YOU! For those of you that would like to join us as we endeavor to preserve and be a part of making our much loved Fort not only prosper but thrive, please contact me at lesamisdufortdechartres@gmail.com for further details of how you can participate and help us continue to grow in 2019!